The National Museum of Ireland (Irish: Ard-Mhúsaem na hÉireann) is Ireland's leading museum institution, with a strong emphasis on national and some international archaeology, Irish history, Irish art, culture, and natural history. It has three branches in Dublin and one in County Mayo. The National Museum of Ireland descends from the amalgamation of parts of the collections of a number of Dublin cultural institutions from the 18th and 19th centuries, including the Royal Dublin Society (RDS) and the Royal Irish Academy (RIA). The earliest parts of the collections are largely geological and mineralogical specimens, which the RDS collected as a means to improve the knowledge and use of such resources in Ireland. The establishment of the museum collections is generally deemed to have been with the purchase of the collection of Nathaniel Gottfried Leske in 1792. One of the earliest iterations of the RDS museum was in Hawkins Street House, where the Leskean Cabinet was displayed along with a collection of casts and busts. This exhibition was open to the public between noon and 3pm, on Monday, Wednesday and Friday. Aside from the exhibition there was a lecture hall, laboratory and library. From here, the museum moved to Leinster House in 1815 when the RDS purchased it from His Grace The 3rd Duke of Leinster. Here the Leskean Cabinet continued to be displayed, along with newly accessioned collections from the professor of mineralogy and geology, Charles Lewis Giescke, curiosities, and the Hibernicum which was a display of minerals and geological specimens from the island of Ireland. It was Giescke who first referred to the museum as the "National Museum of Ireland" - in 1832 in his catalogue of the entomology and ornithology specimens. After Giescke's death in 1833, John Scouler was appointed curator in 1834. During this time the collections were open to public two days a week from noon to 3pm, and to students at all times. By this time the need for a new museum was deemed to be critical. This led to the construction of the building which now houses the Natural History Museum on Merrion Street. With the planned expansion and development of the museum, Scouler requested that a curator or Director been employed by the RDS. This led to the appointment of Alexander Carte in 1851. Carte overhauled and reorganised the collections, overseeing acquisitions from Sir Francis McClintock, Sir William Wilde, and Sir Richard Griffith. The museum took part in the International Exhibition of Art-Industry of 1853 exhibiting objects in the Hall of Antiquities along with the RIA. Following this the museum opened five days a week to the public. 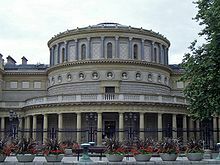 The Science and Art Museum was established in 1877, becoming the National Museum of Science and Art in 1900, and the National Museum of Ireland after independence. It also included the collection of the Museum of Irish Industry, founded in 1847. The collections of both the RIA and RDS formed the basis for the Archaeology and History section of the Museum at Kildare Street. This is the original site opened in 1890 as the Dublin Museum of Science and Art in the building designed by Sir Thomas Newenham Deane and his son, Thomas Manly Deane. Until 1922, the museum complex also included Leinster House, now the home of the Oireachtas. The National Museum of Ireland – Archaeology on Kildare Street has displays on prehistoric Ireland, including early work in gold, church treasures and objects from the Viking and medieval periods. The Kingship and Sacrifice exhibition includes well preserved bog bodies and Ralaghan Man. There are special displays of items from Egypt, Cyprus and the Roman world, and special exhibitions are regularly mounted. This section includes famous examples of early medieval Celtic metalwork in Ireland such as the Ardagh Chalice, the Tara Brooch, and the Derrynaflan Hoard. Prehistoric pieces include the Iron Age Broighter Gold and over 50 gold lunulas (not all on display), and other Bronze Age jewellery. Many of these pieces were found in the 19th century by poor people or agricultural labourers, when population expansion led to cultivation of land which had not been touched since the Middle Ages. Indeed, without the intervention of George Petrie of the Royal Irish Academy and like-minded individuals from the Royal Society of Antiquaries of Ireland, most of the metalwork would have been melted down for the intrinsic value of its materials, as did frequently happen despite their efforts. Contemporary Irish are more tuned to their heritage, as can be seen in the example of the Irish Bog Psalter, which was discovered and reported by an alert machine operator in July 2006. National Museum of Ireland – Decorative Arts and History, including the Great Seal of the Irish Free State, is the part of the collection kept at the large Collins Barracks site, a former military barracks named after Michael Collins in 1922. This site, opened in 1997, also holds the Museum's administrative centre, a shop and a coffee shop. This section has displays of furniture, silver, ceramics and glassware, as well as examples of folk life and costume, and money and weapons. A Chinese porcelain vase from about 1300 AD, the Fonthill vase, is one of the features. The Soldiers & Chiefs exhibition features military artifacts and memorabilia tracing Ireland's military history from 1550 to the present. Special exhibitions are mounted regularly; in summer 2007, for example, replicas of six Irish High Crosses that were subsequently shown internationally. Country Life is the most recent part of the museum to be opened. It is located just outside Turlough village, on the N5 eight kilometres east of Castlebar, in County Mayo, and was opened in 2001. The museum is focused on ordinary life from the mid-19th century to the mid-20th century, with much of the material coming from rural Ireland in the 1930s. There are displays on the home, the natural environment, communities and forces for change. The Natural History Museum, which is part of the National Museum, although often thought of as distinct, is on Merrion Street in Dublin and houses specimens of animals from around the world. Its collection and Victorian appearance have not changed significantly since the early 20th century. The Museum is overseen by a Board of Directors, of whom two are nominated by the Royal Irish Academy and one by the Royal Dublin Society, both of which have contributed significantly to the institution. It is led operationally by a Director, under whom are a Head of Collections and Learning and a Head of Operations (post currently vacant). Reporting to the Head of Collections and Learning are the Keepers of Antiquities, Art & Industry, Natural History, and Folklife, the Registrar, and the Heads of Conservation, Education, Design and Photography. Within Operations are the Heads of Facilities, Human Resources, Finance, Corporate Affairs, Marketing, Commercial Development and ICT. ^ "National Museum of Ireland annual report 2016" (PDF). 22 December 2017. Retrieved 6 May 2018. ^ a b c d e O'Riordan, C.E. (1983). The Natural History Museum Dublin. Dublin: Stationery Office. ^ "1796 - Dublin Society, Hawkins St., Dublin - Architecture of Dublin City, Lost Buildings of Ireland - Archiseek - Irish Architecture". Archiseek - Irish Architecture. 7 May 2012. Retrieved 29 June 2018. ^ a b c Marie., Bourke, (2011). The story of Irish museums, 1790-2000 : culture, identity and education. Cork: Cork University Press. ISBN 9781859184752. OCLC 698911816. ^ "Staff Information: Organisation Chart". National Museum of Ireland. Retrieved 29 June 2018. ^ "The National Museum of Science and Art - Irish Artists". www.libraryireland.com. Retrieved 23 June 2018. ^ Rynne, Etienne. "Obituaries: Anthony T. Lucas" (PDF). 1986. ^ Hilliard, Mark (5 May 2017). "Tributes paid to former director of National Museum of Ireland". The Irish Times. Retrieved 24 June 2018. ^ "PAT WALLACE THE CV". Irish Independent. 19 June 2005. Retrieved 23 January 2018. ^ "Tribute paid to Dr. Patrick Wallace, Director of National Museum of Ireland". National Museum of Ireland. 29 February 2012. Retrieved 23 January 2018. ^ "R Ó Floinn Appointment - Director". National Museum of Ireland. 3 July 2013. Retrieved 23 January 2018. ^ "Ms Lynn Scarff appointed as new Director of the National Museum of Ireland". National Museum of Ireland. January 2018. Retrieved 20 January 2018. Short Histories of Irish Barracks by Patrick Denis O'Donnell, in An Cosantóir (Journal of the Irish Defence Forces), 1969–1973. Dublin's Collins Barracks over the years, by Patrick Denis O'Donnell in Hollybough, December 1994. Dublin Barracks – A Brief History of Collins Barracks, by Mairead Dunleavy, National Museum of Ireland, 2002 (largely based on work by PD O'Donnell, as acknowledged in Preface and Acknowledgements). Wikimedia Commons has media related to National Museum of Ireland.